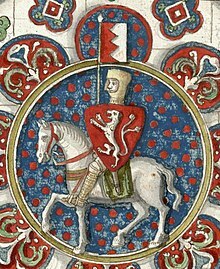 Simon de Montfort, 6th Earl of Leicester (c. 1208 – 4 August 1265) was a Franco-English nobleman. He inherited the title and estates of the earldom of Leicester in England. He led a rebellion against King Henry III of England during the Second Barons' War of 1263–64. He became the de facto ruler of England. During his rule, Montfort called two famous parliaments. The first, the Oxford Parliament of 1258), stripped the King of his unlimited authority. The second parliament was in 1265. Its first meeting was in the Palace of Westminster. In it, de Montfort included ordinary citizens from the towns. For this reason, de Montfort is seen as one of the builders of modern parliamentary democracy. As Earl of Leicester he expelled Jews from the city. When he became ruler of England he cancelled debts owed to Jews. The Jews' records were violently seized. In London and Worcester this policy led to led to massacres. After ruling for just over a year, Montfort was killed by forces loyal to the King in the Battle of Evesham. ↑ 1.0 1.1 1.2 Norgate, Kate 1894. "Montfort, Simon of (1208?-1265)" in Lee, Sidney (ed) The Dictionary of National Biography, volume 38, London: Smith Elder.